The midnight sun came over the northern crest of the great berg, kindling variously-colored fires on every part of its surface, and making us one great piece of gem-work, blazing carbuncles and rubies and molten gold. Elisha Kent Kane, 1850s. In the 19th century, the Arctic was a mysterious and unexplored - by the white man. The Inuit, and other First Nations people, had been living there happily for thousands of years. European explorers were anxious to discover and map the Northwest Passage, a potentially lucrative shipping route. Arctic expeditions were big news and moving panoramas were the news reels of the day. The enormous paintings traveled from town to town. Moving panorama showman told stories of ships "nipped" in the ice and men bravely going where no white man had gone before. Artifacts from the expeditions were brought back and put on display at the shows. To add even more authenticity, some shows had a member of the expedition appear to tell stories first hand. The public was captivated. 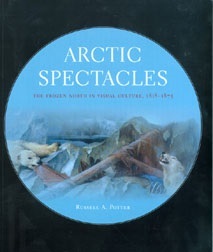 Published in 2007, Artic Spectacles includes an Appendix of all the Artic panoramas created from 1819-1896. Unfortunately, none of the Arctic moving panorama paintings survived. To get an idea of what they might have looked like, we can look to newspaper reviews, broadsides, books, engravings and historians! The best resource is the book Arctic Spectacles, The Frozen North in Visual Culture, 1818-1875 written by Professor Russell A. Potter. Russell is a well versed in both moving panorama history and Victoria era Arctic exploration. The book lists 20 moving panoramas about Arctic exploration! From THE GRAND PANORAMA OF A WHALING VOYAGE 'ROUND THE WORLD. A sinking ship with the crew in a lifeboat. Photo taken by Sue Truman at the panorama's exhibition, Aug. 2018. Although, none of the Arctic moving panoramas survived, there are some examples of moving panoramas that contain icebergs and Actic-like scenery. The Grand Panorama of a Whaling Voyage Round the World, painted in 1848, it is housed at the New Bedford Whaling Museum. They created a wonderful Online Digital Version for research. Click on Roll Three to see iceberg scenes. 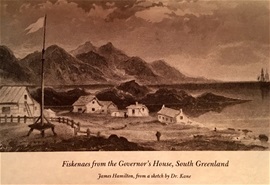 From PANORAMA OF A WHALING VOYAGE. Icebergs, a ship caught in a whirlpool, and unusual looking seals! Photo used with permission by the Peabody Essex Museum. The Panorama of a Whaling Voyage is a crankie-sized, parlor panorama painted in 1860 by Thomas Davidson. It is housed at the Peabody Essex Museum in Salem, MA. From THE LOSS OF THE TITANIC. By 1912, moving panoramas had all but died out. But the sinking of the Titanic was such a powerful story, Poole Sr. felt iT would be successful and he was right. Reportedly, it was more like going to a church than a show hall. The audiences were very solemn. Photo from the Univ. of Exeter. The Titanic didn't sink in the Artic, however, it was an Arctic iceberg that drifted south into the Atlantic and sank the Titanic. 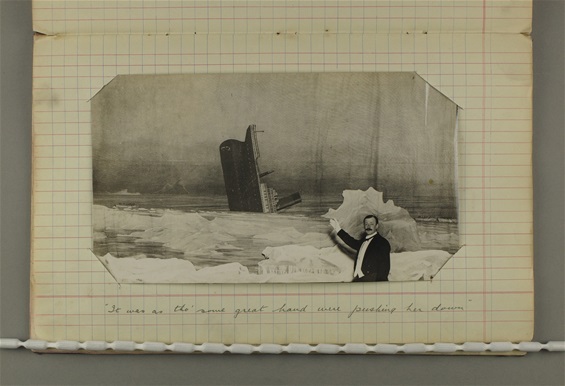 The photo shows John R. Poole in front of his 1912 Myriorama Show entitled The Loss of the Titanic. The Titanic ship and the icebergs in front are cardboard/plywood cut outs. Hidden from view, the crew would be moving the iceberg toward the ship which sinks into a slit cut into the scroll. See the whole album of photos at this link from the Bill Douglas Museum, University of Exeter. Sir John Franklin led the Artic Expedition in 1845 to discover the Northwest Passage. 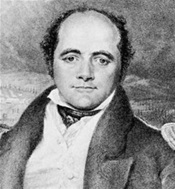 The most famous Arctic expedition was that of Sir John Franklin's in 1845. The expedition was to finish mapping the Northwest Passage (sea route from the Atlantic to the Pacific above North America). Both ships, the HMS Erebus and the HMS Terror, became trapped in the ice and were iced-in for years. The crew of 128 men were lost to starvation, hypothermia and illness. This was THE BIG STORY of the decade and insprired many moving panoramas. Watch this 4 minute PBS slide show narrated by master story teller/lecturer Russell Potter. Elisha Kent Kane (1820-1857) standing beside one of the graves of the Franklin Expedition, with his faithful dog. Wealthy shipping merchant Henry Grinnell financed two expeditions to rescue Franklin and his men. Neither expedition was successful in finding the ships and men but they did find Franklin's winter camp with empty food tins and three graves. Not a good sign. Elisha Kent Kane, chief medical officer of the 1st expedition and leader of the 2nd expedition, went on to become famous in his own right. 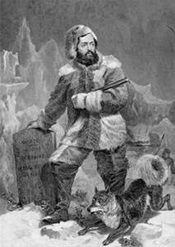 During the 2nd expedition, when their ship became trapped in the ice, Kane lead a daring 83 day overland escape to safety. The engravings and stories from Artic Explorations inspired four different moving panoramas. While on the expeditions, Kane made sketches and kept a journal. 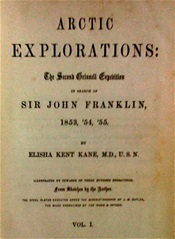 When he returned he wrote Arctic Explorations: The Second Grinnell Expedition in Search of Sir John Franklin 1853, 54, 55. His sketches were turned into engravings. The book became a best seller. 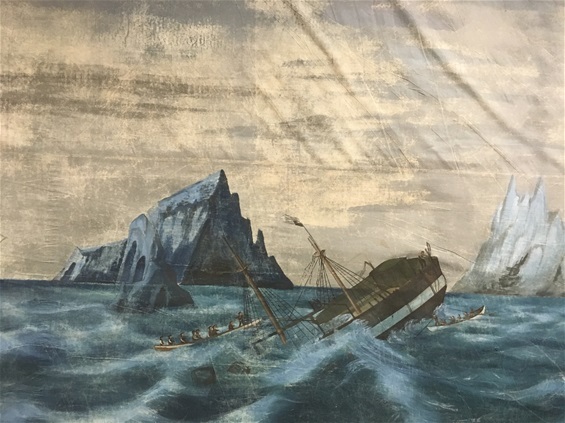 Filled with dramatic survival stories and beautiful illustrations, Arctic Explorations became excellent source material for moving panorama proprietors and artists. The broadside pictured below, advertises one of those moving panoramas. Broadsides can provide insight into the show and moving panorama painting. This one is a great example. From the collection of Douglas Wamsley, used with permission. THE MACHINIST or "crankist" (C. A. Oscar) is listed in the credits under the main title which was unusual. The crankist was hidden from view during the performance and seldom mentioned in advertisements. However, the machinist was actually very important! You can't have a moving panorama without one! ITEMS ON DISPLAY - This show boasts a life-size wax figure of Dr. Kane, the most perfect likeness ever put in wax! In addition, the celebrated Esquimaux dog, Artic suits and Esquimaux dresses were on exhibition during the day. SCENES IN THE PAINTING - Best of all, this broadside lists the scenes in the painting. This story had everything: exotic scenery, drama, opportunites for special effects and it was educational. Being the sensational story of the day, the public was eager to see it. 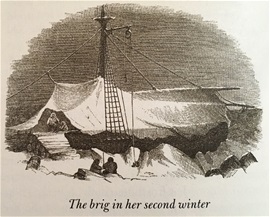 I have matched up some of the scene titles with illustrations from the Arctic Explorations book. They stopped off for two days in the Fiskerneas where they were able to obtain additional provisions. The last stop before encountering the pack ice and giant bergs. Engraving by James Hamilton, based on a sketch by Elisha Kent Kane. 6. CROSSING THE ICE BELT. 9. THE THREE BROTHER'S TURRETS AND TENNYSON'S MONUMENT - Described by Arctic Navigators as among the most wonderful of nature's freaks. 13. OPEN POLAR SEA from Cape Jefferson as discovered by Mr. William Morton. 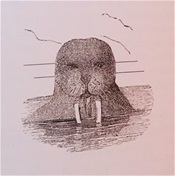 From "Arctic Explorations" based on a sketch by Dr. Kane. 19. LEAVING THE BRIG FOR HOME. The broken floes. One group broke through the ice, but no lives were lost and the supplies were saved. Engraving by James Hamilton, based on a sketch by Elisha Kane. 20. BOAT CAMP IN A STORM. 22. PARTING WITH THE ESQUIMAUX. 23. A NARROW ESCAPE OF WEARY MAN'S REST. 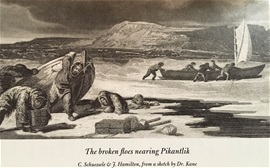 For more information on the Arctic Moving Panoramas of Elisha Kent Kane, see this webpage by Professor Russell Potter. 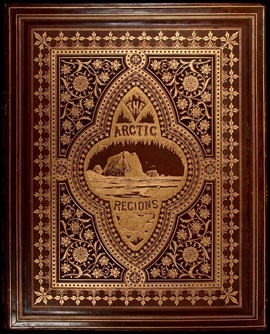 This gorgeous image is the cover Arctic Regions, published in 1873. It contains 141 photographs taken by William Bradford. Image courtesy of Russell Potter. Special thanks to Russell Potter, Douglas Wamsley, The Bill Douglas Museum and the San Francisco Museum of Fine Art for permission to use their images.